Christmas Croissant Breakfast Casserole is the perfect solution to the “what should I give them for breakfast” holiday question. This creamy, cheesy, egg-y recipe is assembled the night before, so all you have to do is bake in the morning. 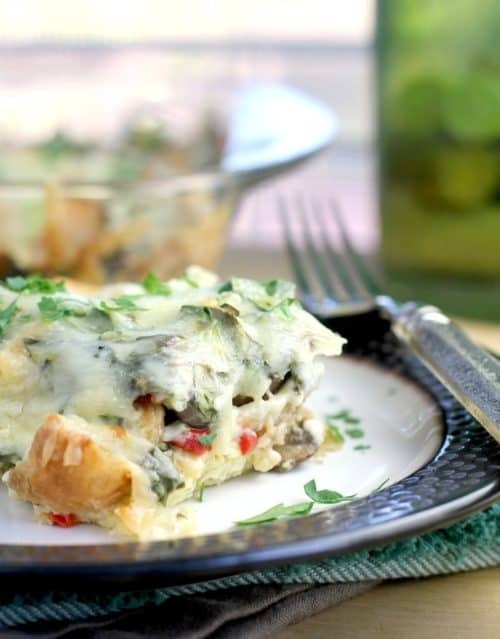 And with mushrooms, red bell pepper, and [surprise] poblano pepper AND three cheeses, this decadent vegetarian dish will become a family favorite for all. 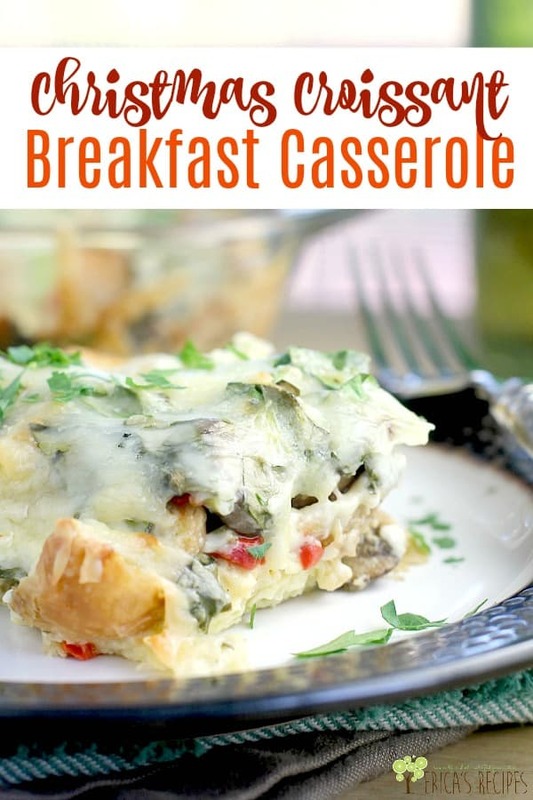 So, this post is almost feeling like a drive-by, because I am just throwing this Christmas Croissant Breakfast Casserole recipe out into the world with no story, no hook. But it is such a really delicious recipe, and I have now made this two years in a row, so it is ready. 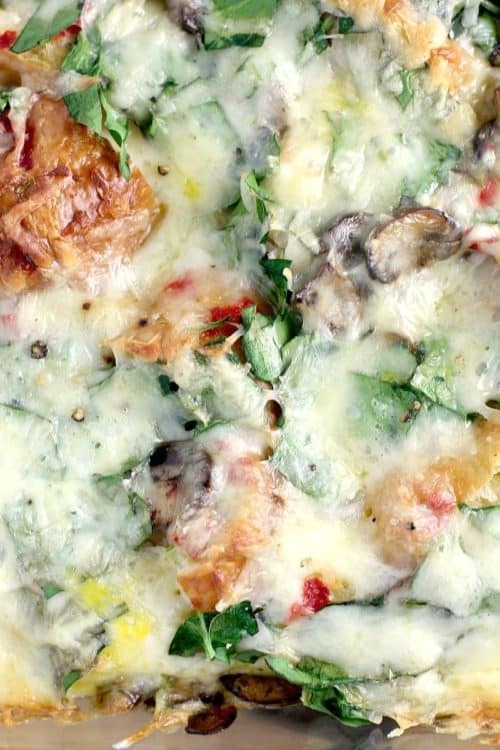 I love that it is vegetarian – it doesn’t need meat, but you could always add it if you’d like. I just think that on a big holiday when you are going to be shelling out shloads of food all day, keep breakfast lighter without the meat. This recipe is rich enough. And I LOVE that I used poblano pepper for a teensy bit of zip every couple bites. 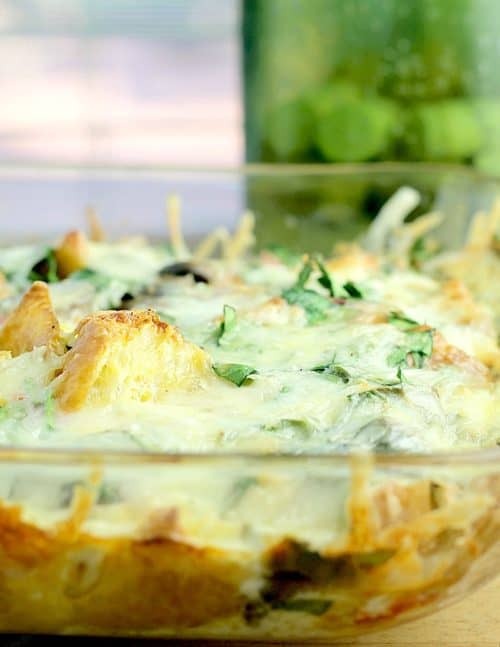 Poblano peppers are SO dang tasty and they really make this casserole perfect. That’s it! 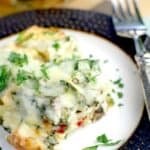 MAKE this Christmas Croissant Breakfast Casserole recipe, it is easy but fancy, pretty and festive. All the feelz for your holiday breakfast to share with those you love. Christmas Croissant Breakfast Casserole is the perfect solution to the "what should I give them for breakfast" holiday question. Under the oven broiler, roast the peppers, turning every 4-5 minutes, until skin is blackened and blistered all over. Move peppers to a ziploc bag to allow to steam. Once cool enough to handle, remove and discard the skins and seeds. Chop and set aside. In the butter, brown the mushrooms. For instructions on how to brown mushrooms properly, see <a title="here" href="https://ericasrecipes.com/2013/06/how-to-brown-mushrooms/">here</a>. 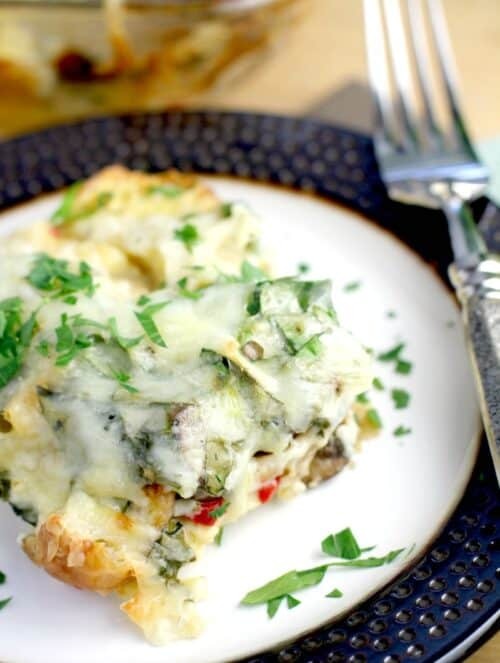 In a 13x9 baking dish, toss together the peppers, mushrooms, croissant pieces, green onion, and parsley. Top with the cheeses. Combine the eggs, cream, milk, salt, and pepper. Pour over the casserole. Cover with plastic wrap and put in the fridge to set overnight. Bake at 350F for 45 minutes or until center is set. Allow to cool 10 minutes before serving. Yields 8 servings. We always make a special breakfast on Christmas morning. 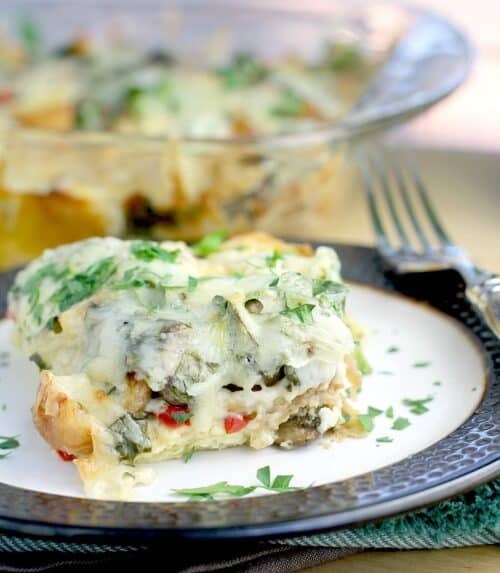 Your breakfast casserole sounds absolutely perfect to ring in the holiday! 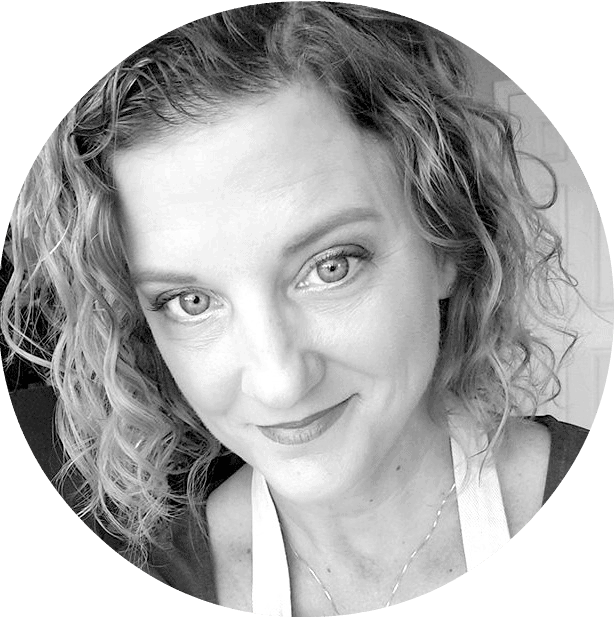 This recipe has so many ingredients I enjoy that my kiddos will not eat. I can’t wait to make it and keep it all to myself. It looks delicious! The easy recipes are the best! Have to give this a try asap! I think it would be perfect for weekends too! We celebrate Christmas Eve with my husband’s family, and Christmas day with mine. The morning of Christmas is our special time. This casserole will be lovely for our celebration. I’m actually drooling just looking at this. Looks and sounds SO amazing- the perfect Christmas (or New Year’s) morning breakfast!